This article is about the geometric figure. For other uses, see Ellipse (disambiguation). "Elliptical" redirects here. For the syntactic omission of words, see Ellipsis (linguistics). For the punctuation mark, see Ellipsis. In mathematics, an ellipse is a curve in a plane surrounding two focal points such that the sum of the distances to the two focal points is constant for every point on the curve. As such, it is a generalization of a circle, which is a special type of an ellipse having both focal points at the same location. The elongation of an ellipse is represented by its eccentricity, which for an ellipse can be any number from 0 (the limiting case of a circle) to arbitrarily close to but less than 1. Analytically, an ellipse may also be defined as the set of points such that the ratio of the distance of each point on the curve from a given point (called a focus or focal point) to the distance from that same point on the curve to a given line (called the directrix) is a constant. This ratio is the above-mentioned eccentricity of the ellipse. An ellipse may also be defined analytically as the set of points for each of which the sum of its distances to two foci is a fixed number. Ellipses are common in physics, astronomy and engineering. For example, the orbit of each planet in the solar system is approximately an ellipse with the barycenter of the planet–Sun pair at one of the focal points. The same is true for moons orbiting planets and all other systems having two astronomical bodies. The shapes of planets and stars are often well described by ellipsoids. Ellipses also arise as images of a circle under parallel projection and the bounded cases of perspective projection, which are simply intersections of the projective cone with the plane of projection. It is also the simplest Lissajous figure formed when the horizontal and vertical motions are sinusoids with the same frequency. A similar effect leads to elliptical polarization of light in optics. The name, ἔλλειψις (élleipsis, "omission"), was given by Apollonius of Perga in his Conics, emphasizing the connection of the curve with "application of areas". yields a circle and is included.
) of the ellipse. This property should not be confused with the definition of an ellipse with help of a directrix (line) below. Using Dandelin spheres one can prove that any plane section of a cone with a plane, which does not contain the apex and whose slope is less than the slope of the lines on the cone, is an ellipse. It follows from the equation that the ellipse is symmetric with respect to both of the coordinate axes and hence symmetric with respect to the origin. This definition relies on the major axis 2a of an ellipse not being shorter than its minor axis 2b. Ellipses with equal axes are simply circles, that is, ellipses with zero eccentricity. The degree of flatness of ellipses increases as their eccentricity does. may also be viewed as the radius of curvature of the osculating circles at the vertices on the major axis. intersects an ellipse at 0, 1 or 2 points. In the first case the line is called exterior line, in the second case tangent and secant in the third case. Through any point of an ellipse there is exactly one tangent. has a second point with the ellipse in common. , which proves the vector equation. the ellipse is a circle and "conjugate" means "orthogonal". The axes are still parallel to the x- and y-axes. Parameter t can be taken as shown in the diagram and is due to de la Hire. with the x-axis (see diagram at right). For other interpretations of parameter t see section Drawing ellipses. Rational representations of conic sections are popular with Computer Aided Design (see Bezier curve).
) are not covered by the representation. This description of the tangents of an ellipse is an essential tool for the determination of the orthoptic of an ellipse. The orthoptic article contains another proof, which omits differential calculus and trigonometric formulae. A parametric representation of an arbitrary ellipse is contained in the section Ellipse as an affine image of the unit circle x2 + y2 = 1 below. and parallel to the minor axis are called directrices of the ellipse (see diagram). , which is the eccentricity of a circle, is in this context not allowed. One may consider the directrix of a circle to be the line at infinity. ). All of these non-degenerate conics have, in common, the origin as a vertex (see diagram). 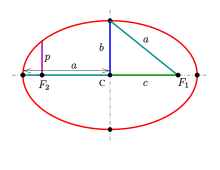 Ellipse: the tangent bisects the supplementary angle of the angle between the lines to the foci. Rays from one focus reflect off the ellipse to pass through the other focus. Because the tangent is perpendicular to the normal, the statement is true for the tangent and the supplementary angle of the angle between the lines to the foci (see diagram), too. The rays from one focus are reflected by the ellipse to the second focus. This property has optical and acoustic applications similar to the reflective property of a parabola (see whispering gallery). are not the vertices of the ellipse. are vectors of the Euclidean space. (M) The midpoints of parallel chords lie on a diameter. The diameter and the parallel chords are orthogonal. An affine transformation in general does not preserve orthogonality but does preserve parallelism and midpoints of line segments. Hence: property (M) (which omits the term orthogonal) is true for any ellipse. The term conjugate diameters is a kind of generalization of orthogonal. belongs to its conjugate diameter. This circle is called orthoptic of the given ellipse. Ellipses appear in descriptive geometry as images (parallel or central projection) of circles. There exist various tools to draw an ellipse. Computers provide the fastest and most accurate method for drawing an ellipse. However, technical tools (ellipsographs) to draw an ellipse without a computer exist. The principle of ellipsographs were known to Greek mathematicians (Archimedes, Proklos). If there is no ellipsograph available, the best and quickest way to draw an ellipse is to draw an Approximation by the four osculating circles at the vertices. the knowledge of the axes and the semi-axes is necessary (or equivalent: the foci and the semi-major axis). If this presumption is not fulfilled one has to know at least two conjugate diameters. With help of Rytz's construction the axes and semi-axes can be retrieved. and the axes of the ellipse. , which is parallel to the major axis, at an ellipse point (see diagram). (4) Repeat steps (3) and (4) with different lines through the center. The characterization of an ellipse as the locus of points so that sum of the distances to the foci is constant leads to a method of drawing one using two drawing pins, a length of string, and a pencil. In this method, pins are pushed into the paper at two points, which become the ellipse's foci. A string tied at each end to the two pins and the tip of a pencil pulls the loop taut to form a triangle. The tip of the pencil then traces an ellipse if it is moved while keeping the string taut. Using two pegs and a rope, gardeners use this procedure to outline an elliptical flower bed—thus it is called the gardener's ellipse. A similar method for drawing confocal ellipses with a closed string is due to the Irish bishop Charles Graves. is the angle of the slope of the paper strip. , which is the radius of the large circle. This restriction may be a disadvantage in real life. More flexible is the second paper strip method. A nice application: If one stands somewhere in the middle of a ladder, which stands on a slippery ground and leans on a slippery wall, the ladder slides down and the persons feet trace an ellipse. Ellipses with Tusi couple. Two examples: red and cyan. (see diagram). After this operation the movement of the unchanged half of the paperstrip is unchanged. The advantage of this variation is: Only one expensive sliding shoe is necessary. One should be aware that the end, which is sliding on the minor axis, has to be changed. is the angle of slope of the paper strip. This method is the base for several ellipsographs (see section below). Similar to the variation of the paper strip method 1 a variation of the paper strip method 2 can be established (see diagram) by cutting the part between the axes into halves. (3) the intersection points of this line with the axes are the centers of the osculating circles. The centers for the remaining vertices are found by symmetry. With help of a French curve one draws a curve, which has smooth contact to the osculating circles. , then the intersection points of corresponding lines form a non-degenerate projective conic section. the points of the second quarter of the ellipse can be determined. Analogously one gets the points of the lower half of the ellipse. The Steiner generation also exists for hyperbolas and parabolas. It is sometimes called a parallelogram method because one can use other points rather than the vertices, which starts with a parallelogram instead of a rectangle. Most technical instruments for drawing ellipses are based on the second paperstrip method. This expression is the cotangent of the angle between the two lines. At first the measure is available for chords, which are not parallel to the y-axis, only. But the final formula works for any chord. Like a circle, such an ellipse is determined by three points not on a line. At first the measure is available only for chords which are not parallel to the y-axis. But the final formula works for any chord. The proof follows from a straightforward calculation. For the direction of proof given that the points are on an ellipse, one can assume that the center of the ellipse is the origin. , not through the center of the ellipse. The intersection point of two polars is the pole of the line through their poles. respectively belong to pairs of pole and polar. Pole-polar relations exist for hyperbolas and parabolas, too. (obtained by solving for flattening, then computing the semi-minor axis). using Gauss's arithmetic-geometric mean; this is a quadratically converging iterative method. The inverse function, the angle subtended as a function of the arc length, is given by the elliptic functions. is the perimeter of an inscribed rhombus with vertices at the endpoints of the major and the minor axes. by factors a and b along the two axes. is the angle from the positive horizontal axis to the ellipse's major axis. points towards the center (as illustrated on the right), and positive if that direction points away from the center.
. It is the distance from a focus of the ellipse to the ellipse itself, measured along a line perpendicular to the major axis. is called a Tusi couple. inellipses: ellipses which touch the sides of a triangle. 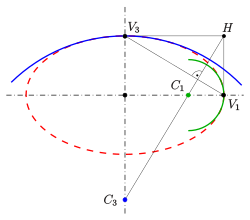 Special cases are the Steiner inellipse and the Mandart inellipse. If the water's surface is disturbed at one focus of an elliptical water tank, the circular waves of that disturbance, after reflecting off the walls, converge simultaneously to a single point: the second focus. This is a consequence of the total travel length being the same along any wall-bouncing path between the two foci. Similarly, if a light source is placed at one focus of an elliptic mirror, all light rays on the plane of the ellipse are reflected to the second focus. Since no other smooth curve has such a property, it can be used as an alternative definition of an ellipse. (In the special case of a circle with a source at its center all light would be reflected back to the center.) If the ellipse is rotated along its major axis to produce an ellipsoidal mirror (specifically, a prolate spheroid), this property holds for all rays out of the source. Alternatively, a cylindrical mirror with elliptical cross-section can be used to focus light from a linear fluorescent lamp along a line of the paper; such mirrors are used in some document scanners. Sound waves are reflected in a similar way, so in a large elliptical room a person standing at one focus can hear a person standing at the other focus remarkably well. The effect is even more evident under a vaulted roof shaped as a section of a prolate spheroid. Such a room is called a whisper chamber. The same effect can be demonstrated with two reflectors shaped like the end caps of such a spheroid, placed facing each other at the proper distance. Examples are the National Statuary Hall at the United States Capitol (where John Quincy Adams is said to have used this property for eavesdropping on political matters); the Mormon Tabernacle at Temple Square in Salt Lake City, Utah; at an exhibit on sound at the Museum of Science and Industry in Chicago; in front of the University of Illinois at Urbana–Champaign Foellinger Auditorium; and also at a side chamber of the Palace of Charles V, in the Alhambra. In the 17th century, Johannes Kepler discovered that the orbits along which the planets travel around the Sun are ellipses with the Sun [approximately] at one focus, in his first law of planetary motion. Later, Isaac Newton explained this as a corollary of his law of universal gravitation. More generally, in the gravitational two-body problem, if the two bodies are bound to each other (that is, the total energy is negative), their orbits are similar ellipses with the common barycenter being one of the foci of each ellipse. The other focus of either ellipse has no known physical significance. The orbit of either body in the reference frame of the other is also an ellipse, with the other body at the same focus. The general solution for a harmonic oscillator in two or more dimensions is also an ellipse. Such is the case, for instance, of a long pendulum that is free to move in two dimensions; of a mass attached to a fixed point by a perfectly elastic spring; or of any object that moves under influence of an attractive force that is directly proportional to its distance from a fixed attractor. Unlike Keplerian orbits, however, these "harmonic orbits" have the center of attraction at the geometric center of the ellipse, and have fairly simple equations of motion. In electronics, the relative phase of two sinusoidal signals can be compared by feeding them to the vertical and horizontal inputs of an oscilloscope. If the display is an ellipse, rather than a straight line, the two signals are out of phase. Two non-circular gears with the same elliptical outline, each pivoting around one focus and positioned at the proper angle, turn smoothly while maintaining contact at all times. Alternatively, they can be connected by a link chain or timing belt, or in the case of a bicycle the main chainring may be elliptical, or an ovoid similar to an ellipse in form. Such elliptical gears may be used in mechanical equipment to produce variable angular speed or torque from a constant rotation of the driving axle, or in the case of a bicycle to allow a varying crank rotation speed with inversely varying mechanical advantage. Elliptical bicycle gears make it easier for the chain to slide off the cog when changing gears. An example gear application would be a device that winds thread onto a conical bobbin on a spinning machine. The bobbin would need to wind faster when the thread is near the apex than when it is near the base. In lamp-pumped solid-state lasers, elliptical cylinder-shaped reflectors have been used to direct light from the pump lamp (coaxial with one ellipse focal axis) to the active medium rod (coaxial with the second focal axis). In laser-plasma produced EUV light sources used in microchip lithography, EUV light is generated by plasma positioned in the primary focus of an ellipsoid mirror and is collected in the secondary focus at the input of the lithography machine. In statistics, a bivariate random vector (X, Y) is jointly elliptically distributed if its iso-density contours—loci of equal values of the density function—are ellipses. The concept extends to an arbitrary number of elements of the random vector, in which case in general the iso-density contours are ellipsoids. A special case is the multivariate normal distribution. The elliptical distributions are important in finance because if rates of return on assets are jointly elliptically distributed then all portfolios can be characterized completely by their mean and variance—that is, any two portfolios with identical mean and variance of portfolio return have identical distributions of portfolio return. Drawing an ellipse as a graphics primitive is common in standard display libraries, such as the MacIntosh QuickDraw API, and Direct2D on Windows. Jack Bresenham at IBM is most famous for the invention of 2D drawing primitives, including line and circle drawing, using only fast integer operations such as addition and branch on carry bit. M. L. V. Pitteway extended Bresenham's algorithm for lines to conics in 1967. Another efficient generalization to draw ellipses was invented in 1984 by Jerry Van Aken. In 1970 Danny Cohen presented at the "Computer Graphics 1970" conference in England a linear algorithm for drawing ellipses and circles. In 1971, L. B. Smith published similar algorithms for all conic sections and proved them to have good properties. These algorithms need only a few multiplications and additions to calculate each vector. It is beneficial to use a parametric formulation in computer graphics because the density of points is greatest where there is the most curvature. Thus, the change in slope between each successive point is small, reducing the apparent "jaggedness" of the approximation. Composite Bézier curves may also be used to draw an ellipse to sufficient accuracy, since any ellipse may be construed as an affine transformation of a circle. The spline methods used to draw a circle may be used to draw an ellipse, since the constituent Bézier curves behave appropriately under such transformations. It is sometimes useful to find the minimum bounding ellipse on a set of points. The ellipsoid method is quite useful for attacking this problem. Superellipse, a generalization of an ellipse that can look more rectangular or more "pointy"
^ The German term for this circle is Leitkreis which can be translated as "Director circle", but that term has a different meaning in the English literature (see Director circle). ^ K. Strubecker: Vorlesungen über Darstellende Geometrie. Vandenhoeck & Ruprecht, Göttingen 1967, S. 26. ^ J. van Mannen: Seventeenth century instruments for drawing conic sections. In: The Mathematical Gazette. Vol. 76, 1992, p. 222–230. ^ Ivory, J. (1798). "A new series for the rectification of the ellipsis". Transactions of the Royal Society of Edinburgh. 4 (2): 177–190. doi:10.1017/s0080456800030817. ^ Bessel, F. W. (2010). "The calculation of longitude and latitude from geodesic measurements (1825)". Astron. Nachr. 331 (8): 852–861. arXiv:0908.1824. Bibcode:2010AN....331..852K. doi:10.1002/asna.201011352. Englisch translation of Bessel, F. W. (1825). "Über die Berechnung der geographischen Längen und Breiten aus geodätischen Vermesssungen". Astron. Nachr. 4 (16): 241–254. arXiv:0908.1823. Bibcode:1825AN......4..241B. doi:10.1002/asna.18260041601. ^ Ramanujan, Srinivasa (1914). "Modular Equations and Approximations to π". Quart. J. Pure App. Math. 45: 350–372. ISBN 9780821820766. ^ Jameson, G.J.O. (2014). "Inequalities for the perimeter of an ellipse". Mathematical Gazette. 98 (542): 227–234. doi:10.1017/S002555720000125X. ^ Larson, Ron; Hostetler, Robert P.; Falvo, David C. (2006). "Chapter 10". Precalculus with Limits. Cengage Learning. p. 767. ISBN 978-0-618-66089-6. ^ Young, Cynthia Y. (2010). "Chapter 9". Precalculus. John Wiley and Sons. p. 831. ISBN 978-0-471-75684-2. ^ a b Lawrence, J. Dennis, A Catalog of Special Plane Curves, Dover Publ., 1972. ^ Grant, George B. (1906). A treatise on gear wheels. Philadelphia Gear Works. p. 72. ^ Chamberlain, G. (February 1983). "A characterization of the distributions that imply mean—Variance utility functions". Journal of Economic Theory. 29 (1): 185–201. doi:10.1016/0022-0531(83)90129-1. ^ Owen, J.; Rabinovitch, R. (June 1983). "On the class of elliptical distributions and their applications to the theory of portfolio choice". Journal of Finance. 38 (3): 745–752. doi:10.1111/j.1540-6261.1983.tb02499.x. JSTOR 2328079. ^ Pitteway, M.L.V. (1967). "Algorithm for drawing ellipses or hyperbolae with a digital plotter". The Computer Journal. 10 (3): 282–9. doi:10.1093/comjnl/10.3.282. ^ Van Aken, J.R. (September 1984). "An Efficient Ellipse-Drawing Algorithm". IEEE Computer Graphics and Applications. 4 (9): 24–35. doi:10.1109/MCG.1984.275994. ^ Smith, L.B. (1971). "Drawing ellipses, hyperbolae or parabolae with a fixed number of points". The Computer Journal. 14 (1): 81–86. doi:10.1093/comjnl/14.1.81. Besant, W.H. (1907). "Chapter III. The Ellipse". Conic Sections. London: George Bell and Sons. p. 50. Coxeter, H.S.M. (1969). Introduction to Geometry (2nd ed.). New York: Wiley. pp. 115–9. Miller, Charles D.; Lial, Margaret L.; Schneider, David I. (1990). Fundamentals of College Algebra (3rd ed.). Scott Foresman/Little. p. 381. ISBN 978-0-673-38638-0. Weisstein, Eric W. "Ellipse". MathWorld. Weisstein, Eric W. "Ellipse as special case of hypotrochoid". MathWorld.